Cappuccino made with jackfruit instead of cocoa powder. According to a new study, roasted jackfruit seeds can replace between 50% and 75% of the cocoa that is blended with milk and coffee to make cappuccino without impairing flavor or aroma. 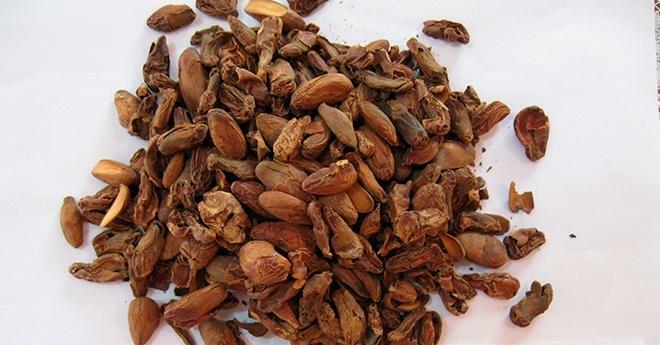 "Flour made from roasted jackfruit seeds naturally releases a mild chocolate aroma," said food scientist Fernanda Papa Spada , a recipient of a scholarship, from São Paulo Research Foundation – FAPESP, who performed the study at the University of São Paulo's Luiz de Queiroz College of Agriculture (ESALQ-USP) in Brazil. Her supervisor was Solange Guidolin Canniatti-Brazaca, a professor at the same institution in the Department of Agroindustry, Food and Nutrition. The search for a cocoa substitute was motivated by the rise in international demand for cocoa, Spada told. This rise in turn is due to the growing demand for chocolate without a corresponding growth in supply, as cocoa-producing countries fail to boost their output. Many Chinese and Indian consumers can afford chocolate for the first time. The world cocoa production has not kept up, and the commodity is increasingly scarce as a result. According to the International Cocoa Organization, 4.568 million metric tons of cocoa beans were processed in the 2017-18 crop year. This was almost the same as the total world production (4.645 million mt). The leading producer in 2017-18 was Ivory Coast, which accounted for approximately 40% of the total, followed by Ghana, Indonesia, Ecuador, Cameroon, Nigeria and Brazil. Brazilian law requires milk chocolate drinks and other chocolate preparations to contain at least 25% cocoa powder in their formulation. Even premium products typically contain less than 30% cocoa powder, the exceptions being dark and semi-dark chocolate (35%). Chocolate powder contains 30%-50% cocoa powder and cocoa butter. Dairy ingredients such as dried milk, butter, sugar and flavoring make up the rest. Canniatti-Brazaca stressed that the rising demand for cocoa and stagnant supply pose major challenges for the food industry, which is, therefore, investing heavily in the search for new cocoa substitutes for use in chocolate and chocolate products. At ESALQ-USP, jackfruit seeds were first identified as a chocolate-flavored ingredient in a project conducted between 2010 and 2013 by Canniatti-Brazaca's group and Miriam Coelho de Souza, a researcher at Piracicaba Methodist University (UNIMEP) in São Paulo State. "The findings showed that the seeds of the hard jackfruit (Artocarpus heterophyllus), among other varieties analyzed, released intense chocolate-like aromas," Canniatti-Brazaca said. Spada recalled that the discovery was accidental and occurred during a class led by Souza. "They were working on the development of food products based on waste left over from fruit processing," she said. "A student baked a loaf of bread made from jackfruit seed flour, and it smelled strongly of chocolate." After the accidental discovery, several studies were performed at ESALQ-USP, and an article was published in PLOS ONE demonstrating the feasibility of using flour made from roasted dry or fermented seeds of hard jackfruit to obtain an aroma similar to that of chocolate in cappuccino. Cappuccino is now available as an instant powder containing coffee with milk and chocolate. The quality and amount of chocolate vary according to the manufacturer. "The more upmarket products use chocolate powder, but many use artificial flavoring," Spada said. Coffee and chocolate alike have a unique flavor and aroma owing to the presence of volatile compounds derived from roasting and fermentation. The challenge faced by these researchers was to determine the ideal conditions for roasting and fermenting jackfruit seeds to obtain a flour with a chocolate-like aroma of optimal intensity without impairing or even altering the coffee flavor of cappuccino. Jackfruit is a large fruit with edible pulp and seeds. The interior consists of bulbs of sticky yellow flesh with a strong sweet aroma, and each bulb encloses a seed. The seeds are an agroindustrial byproduct. They can be consumed but must first be boiled or roasted. Spada and her group analyzed the chemical composition of jackfruit seed flour. "It has no flavor but releases a chocolate aroma after roasting," Spada said. "It has to be fermented first. Without fermentation, jackfruit seed flour does not release this chocolate aroma. We analyzed 33 seed prototypes with varying degrees of roast to determine which had the strongest chocolate aroma." A key part of the study funded by FAPESP consisted of asking volunteers to rank the sensory attributes of the different prototypes of cappuccino comprising varying amounts of flour made from dry or fermented jackfruit seeds. "Initially, we performed a sensory analysis with 20 volunteers by recording their impressions of aroma, flavor and color," Spada said. They sampled cappuccino prototypes with 25%, 50%, 75% and 100% substitution of jackfruit flour for chocolate powder. The final test involved 12 volunteers who reached a consensus on the prototypes considered most similar or identical to conventional cappuccino." The results showed that dry jackfruit seed flour can be incorporated as an ingredient in cappuccino formulations. The substitution of jackfruit flour for chocolate powder at 50%-75% was considered ideal because the acceptability and sensory characteristics were not altered. "According to the participants in the tests, the aroma of the cappuccino preparations made with dry jackfruit seeds resembled cappuccino, chocolate, cinnamon and coffee, with cappuccino and chocolate flavors," Spada said. A. heterophyllus is native to India, where it was domesticated more than 3,000 years ago. Jackfruit is an important part of Indian cuisine and Southeast Asian cooking. The plant was introduced to Brazil by the Portuguese. It flourished so successfully here that it soon grew abundantly, for example, in the Atlantic Rainforest and is still found in the remnants of the biome.